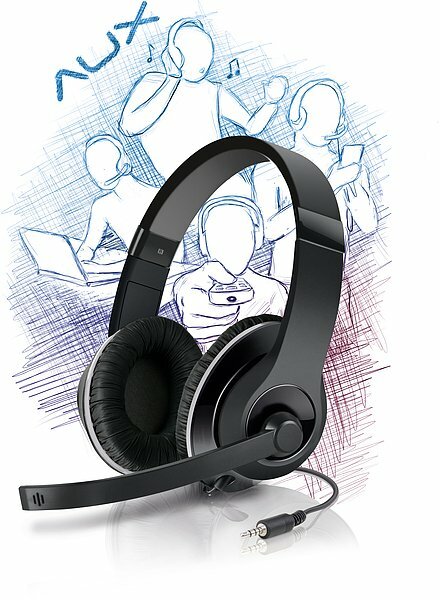 Speedlink reveals the AUX Stereo Headset, it will start shipping in July 2012 with a MSRP of 49.99EUR. It will be available in two color combinations; black/silver and white/red. SPEEDLINK®, specialist in high-quality and stylish sound solutions, presents its very first circumaural stereo headset that’s also perfect for mobile use with smartphones: the AUX. Notebooks, tablets and smartphones make music and digital communications portable. This new freedom and the increasing variety of sound sources call for a totally new generation of headset. The AUX Stereo Headset from SPEEDLINK® is the perfect synthesis of a set of stylish headphones and a convenient microphone headset – and connects to practically any device thanks to its ingenious cable system. It connects to smartphones like the iPhone® and Samsung Galaxy® series – and an ever increasing number of notebooks – via its conveniently short cable featuring a 4-contact 3.5mm jack plug, while a really long adapter cable is included featuring standard headphone and microphone jack plugs for desktop PCs. This means the headset is always there when needed, yet it can be connected in seconds when at home. Despite its smartphone compatibility and refreshing street-style design, the AUX retains all the qualities of the renowned PC headset range offered by SPEEDLINK®: outstanding sound quality and crystal-clear voice chat. Nicely padded circumaural earcups for undisturbed multimedia enjoyment, an integrated inline remote and the light weight of just 260g guarantee maximum comfort and convenience at all times and make the AUX the ideal companion for music and chat whether on the couch or on the street.